Like most authors, music plays a HUGE part in my writing process. I can't write without my ear buds in and the music blasting. If I get a good song it can carry an entire book. Grandfather Said by The Ethnographers was on repeat while I wrote my first book, Kaleidoscope. Most people haven't heard of them. Look them up. I love them. Honestly, every song by The Ethnographers inspired something in The Faylinn Novels--from lyrics to the melody to a feel of their songs--they were my Faylinn anthem. The song I really wanted to talk about today is Skin by Zola Jesus. I'd been stuck trying to evoke the emotion I needed for a particularly emotional scene in Me After You, where the main character, Sawyer, learns her husband was assaulted and is in critical condition (that might sound like a huge spoiler, but I promise, it's not!). When I heard Skin, I started to cry because the scene instantly began to play in slow motion inside my head. It wasn't so much the lyrics as it was the piano and emotion in the singer's voice. For the next hour I wrote with tears pouring down my cheeks! Have you read Me After You? Do you remember the flashback? Can you see the scene play out with the song in the background? You can grab Me After You HERE and keep an eye on Mindy's Facebook page for the next novel in the Willowhaven Series, Me Without You, coming in March! Happy Monday! New year, new blog features! I'm dedicating Monday to music! Music plays an important part in creating a story. Who doesn't recognize the two deep notes (E and F) that play when Jaws is lurking? How many of us can name Star Wars or Harry Potter within a few bars? Each week I'm asking authors, bloggers, designers in the writing world to share their musical muses with you. I'm excited to see how music plays a roll in their creative process. I hope you are too. I listen to music whenever I'm writing. All kinds of music. Sometimes I hear a song and the lyrics or feel of the song completely create a new scene for me. Then other times, I'm listening to something and I'm struck at how perfect it matches up with something I've already done. As you continue to listen you realize so many of these lyrics fit FTW so amazingly well. I kept hearing 'everything will change' and it inspired Jules. Everything did change for her. What do you think? Does it sound like a FTW song to you? Let me know in the comments and stay tuned for some amazing guest posts each Monday! 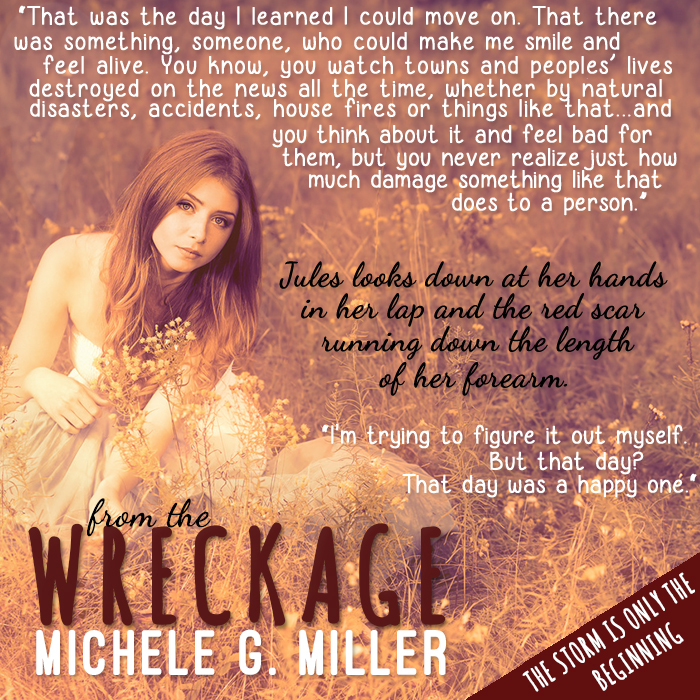 You can grab From The Wreckage for FREE everywhere if you haven't read it yet.